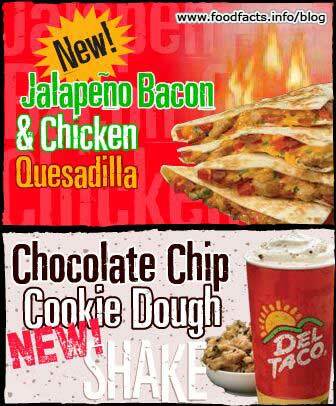 Del Taco has introduced 3 new menu items. First up is the Jalapeno Bacon and Chicken Quesadilla: grilled chicken, jalapeno bacon pieces, diced tomatoes, cilantro and grated cheddar cheese on a flour tortilla. The quesadilla is $2.69. For smaller hands Del Taco has a new kids quesadilla as a kids meal option. "Hand-sized for kids, this new quesadilla features freshly grated cheddar cheese in a warm 6-inch flour tortilla." Del Taco’s Kid Loco meal has two kids quesadillas, an order of small fries, a small drink and a toy for $2.99. For dessert, there's a new Chocolate Chip Cookie Dough Shake priced at $2.19. 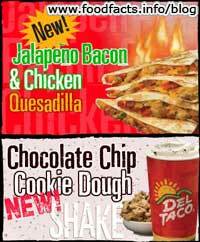 Del Taco has not published nutrition data for these new items yet.